Every year at the end of the summer holidays, my teacher friends start pitying themselves (half-jokingly) when the new school year is about to start. The rest of us mere mortals who have to work with 25 days of annual leave don't exactly feel a lot of pity for them. Well, I have to say that I am about to turn into one of these annoying complainers myself - having enjoyed 6.5 weeks of blissful doing only things I enjoy doing and not having to get up and go to the office, I have a heavy heart just thinking that I have ONLY ONE MORE WEEK off before starting my new job on July 3. Tragic, I know. Let's not forget that I worked 25 hours/week since October, too, so was not exactly burnt out. Be that as it may, I feel the past weeks just whizzed by at fast-forward speed and I secretly wish I could press "Pause" and somehow remain in holiday mode for...um...another 6 months perhaps? First things first - this is a First World Problem if ever there was one, but I'm a shallow person after all, so let me vent a bit, o.k.? 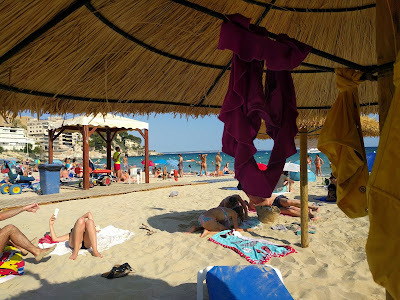 As you might now, I have been spending a few days in Nice every summer for the past years. My friends and I usually go there in late July, early August and this is when shops try to clear out the summer stuff, wooing customers with stickers or labels everywhere saying deuxième démarque or -70% in many cases. Needless to say, everyone who walks into the store can benefit from these reductions and we readily do...ahem. This year, I'll be there in the second half of August, when the sales will probably already have ended, but this is another story. I did not know, however, that there seems to be a system behind seasonal sales in France. 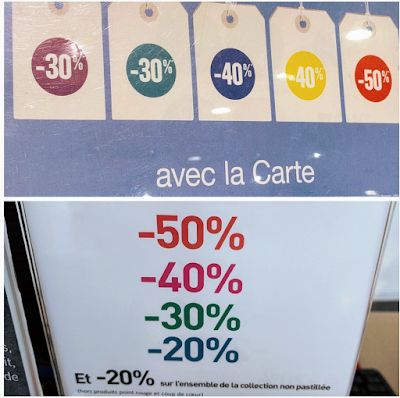 When I was in Lyon last week, I noticed tempting signs with reductions popping up in most stores the second day we were there. Upon closer inspection some (very confusingly, not all, though, meaning you only find out when you are about to pay) of these signs explain that you need to have "la carte", i.e. that store's loyalty card in order to qualify. Depending on how nice the person at the checkout counter is, they can sign you up, even if you are not a resident or ask the person behind you if they are willing to present their card to allow you to get the discount, but in theory, it is not for you, the average tourist itching to whip out her credit card. Bummer! Also, while on a shopaholic frustration rant - I already knew from Nice that Galeries Lafayette for example attaches squares of various colours that stand for the discount - e.g. green = 40%, organge = 50%. There is no "glossary" anywhere though, so you need to ask and it is not the same in every store either, i.e. I found the colours to stand for different percentages in different department stores. Very confusing. Well, I guess I saved money by not being allowed to join the sales party. Minor shopaholic complaints aside, Lyon was absolutely amazing and I can wholeheartedly recommend a visit there - so much to see and do and very friendly locals. The German equivalent of the English proverb "Christmas comes but once a year" is Man muss die Feste feiern, wie sie fallen, roughly translated as "you have to celebrate (happy) occasions whenever they occur". I am a firm believer of that saying and it is the reason why I have made a point to celebrate my birthdays by taking out my friends to a nice place on my birthday. It's not that I want to be the center of attention at all cost (rather the opposite is the case) or want to be showered with gifts (a nice side-effect, admittedly), but I have learned not to save anything "for later" or just to commemorate the really BIG occasions, as you never know if yourself or your friends will still be around then or able to party with you. For example all the places you are dreaming of visiting - don't tell yourself that you will visit when your retired/the kids have grown up/you get a salary rise. If you can find the time and have the financial means to make it happen, make it happen at the next available opportunity. I am sure you will find other great things to do later, too, but you don't want to be bitter later when for some reason you can't make your dreams come true any more for whatever reason and wish you had not waited. 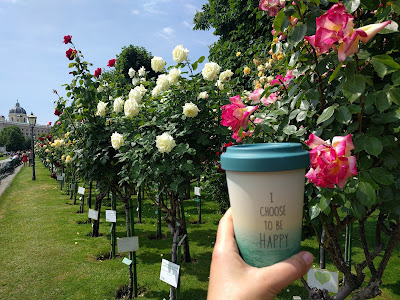 It might take some effort and not always be the most relaxing day for the host(ess), but I am a firm believer that you should indeed celebrate happy occasions or come together just because as often as you can or such occasions present themselves. The giddiness of having found a new job in a field that I am really interested in was replaced by a feeling of nostalgia and sadness earlier this week when I (briefly) visited my former office for the last time on Tuesday and Wednesday. I felt the same leaving Coma HQ even though the circumstances were very different back then. I had colleagues I got a long with very well at both places, but this time, I also identified with the Firm, or the brand on a totally different level. Moreover, I had that end-of-an-era feeling and knew that despite the fact that there were a lot of mutual "let's keep in touch"-es and "we'll catch up again soon"s only time will tell which of your former workmates you will still be in touch with in a few years time. 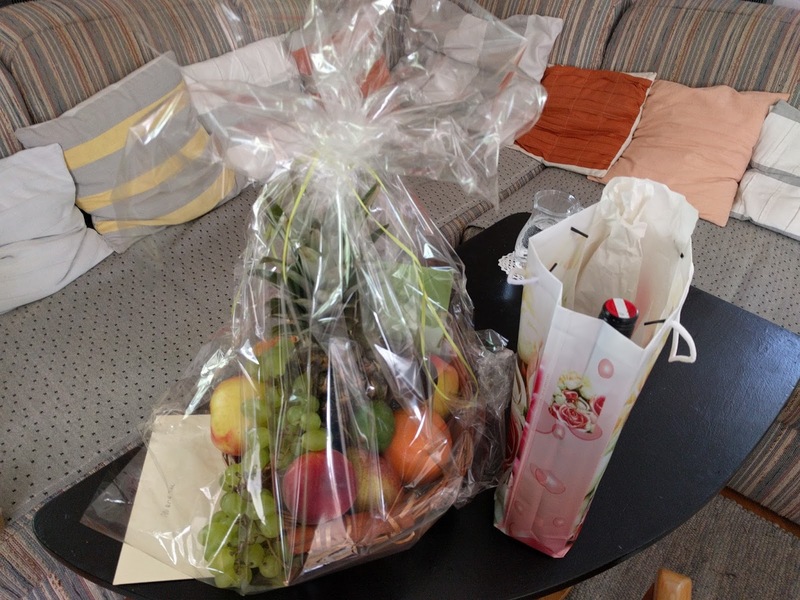 My Vienna colleagues (whom I was not technically in the same team with for the past 5 years) surprised me with a very, very nice DIY gift and a very, very generous monetary one, so I definitely left feeling duly spoilt and valued, but it was still weird. I left the office around 5 on May 31 and arranged to meet a friend afterwards as I realised I didn't want to just go straight home. When I did come home, it was definitely one of those days where I would have appreciated being welcome by someone who is interested in what I have been up to and basically anticipated that I am in a weird mood and need diversion and a cuddle. Thankfully, I had plenty of appointments on the remaining days of the past week and so melancholia gave way to excitement hat I have another month of dolce vita ahead of me. Here's to new beginnings!